I’ve heard about this bridge! Many decades ago, in Hungary. It was described to me as an international bridge between two islands, both owned by a Hungarian family who then declared the “no man’s land” in the middle of the bridge Hungarian territory. The islands together are called Zavikon island (I guess the smaller island is just considered an appendage of the larger one) and they are indeed in the Thousands Islands region. They are indeed owned by a Hungarian family. However, both islands are north of the international border, i.e., they are both in Canada. 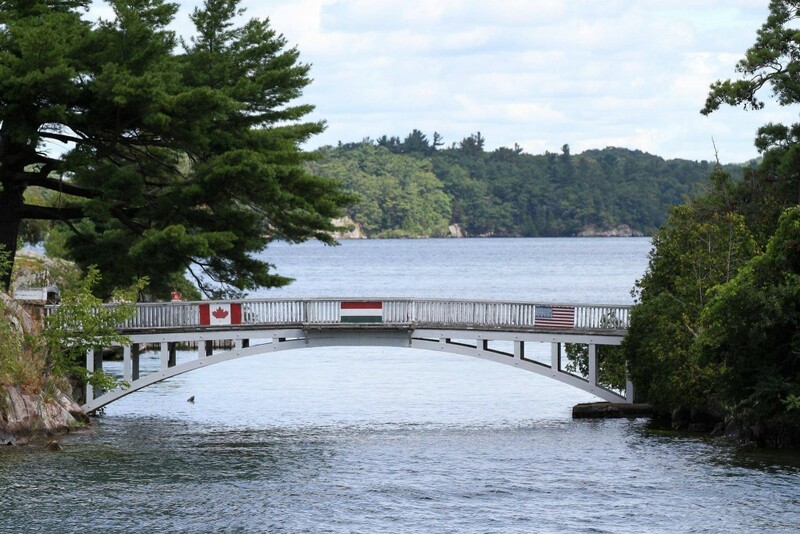 So the flags on this footbridge are really symbolic, they do not reflect political reality. And no, you cannot claim the “no man’s land”, even if it exists along the international border between two states, in the name of a third. I was nonetheless astonished to see that this bridge actually exists and that at least the part about the flags is, indeed, true.